The Ducky Shine 5 carries the goods and the legacy from Shine 4 shape, design and the modern looks. Hairline finish texture is used on the cover to enhance and emphasis a better quality and premium feel. It uses a removable feet design; this takes into account for different users with different preferences. Unlike traditional keyboard feet, detachable feet are more stable, flexible and durable. The Ducky Shine 5 is the first model that comes with ABS double shot backlit keycaps. ABS double shot keycaps are built by two different colors of plastic combined. The keycap surface and the character will not be worn out. The LED lights can emit the light through the keycaps like other ABS backlit keycaps. Double-shot key caps are designed and engineered in a way to give the users the best feel and experience we can and at the same time decorated with special pattern to achieve the best look and usability all at once. Ducky uses a new technique called "2 Double-layer PCB" to improve the backlight and color choice. We put all SMD RGB LEDs on the second Double-layer PCB. Apparently, the SMD LED that we are going to use is larger than other keyboards that you can see on the shelf. This lead to the result of Cherry RGB switches able to improve the brightness with better outcome. The Ducky Shine 5 is powered by an ARM M3 micro-controller. This powerful controller allows advanced functions as well as stunning backlighting effects. Under USB, the Ducky Shine 5 can handle any number of simultaneous key presses. You can use the keyboard confidently in any situation knowing that there will never be ghosting or key blocking issue. Ducky Shine 5 uses the fastest rate available under the USB interface, and updates the keyboard's status to the computer every 1 millisecond. This is to minimize the delay from when the keys are pressed and signal received by your computer. Dimensions 18.11" x 6.06" x 1.33"
i absolutely love the ducky shine 5. i have had 2 mechanical keyboards before this: a k70 (mx blues are WAY too loud) and a strafe (mx silents feel extremely mushy and i dislike them). these are nothing compared to my ducky shine 5.
i purchased mine with mx browns. the space bar is extremely sturdy compared to other keyboards. the double shot keycaps are amazing as well. plus this thing is built like a tank, even though its made of plastic, it has the best build quality ive seen in a keyboard. its not perfect however. i would really like a software instead of whippin' out the manual every time i want to change the lighting. another thing is compared to my corsair boards, the lights are a lot more dull. my final gripe with the ducky shine 5 is at the angle is sit at, the LEDs under the space bar are clearly visible through the gap. 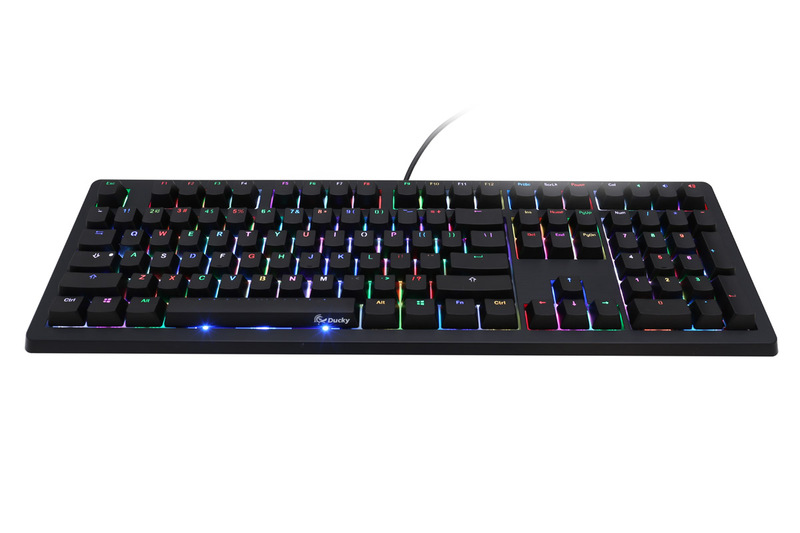 i kinda wish i waited for a ducky shine 5 with mx reds was in stock, but nonetheless im extremely happy with my purchase and i would recommend this board for anyone who is willing to drop $150 on a keyboard. I've preferred mechanical keyboards for years. Dating myself, I began serious typing on noisy IBM Model M keyboards. We currently have DAS, Corsair, and Code models in use. 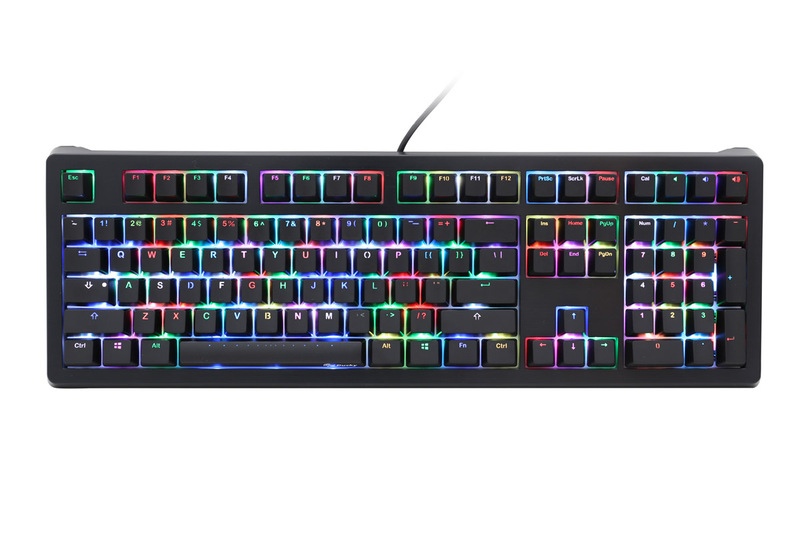 Ducky offers a few features to distinguish the Shine 5 from similarly priced offerings. First, the doubleshot keys are welcome, although I definitely would prefer PBT keycaps rather than ABS. That said, the Shine 5's keycaps are nicely textured, lacking the glossy soon-to-be-slimy feel typical of ABS. I may well replace them at some point, however they are fully serviceable for now. Speaking of keycaps, the font Ducky uses is reasonably legible. It is far more readable than the mess used by Corsair, Deck, and others. Ducky's backlighting also comes through well with the exception of Scroll and Caps lock, which are unlighted. On the plus side, the Ducky keycaps produce less noise than other MX Blue keyboards. That is, except for the space bar. Ducky did not use high quality stabilizers, so there is a hollow "clunk" each time the space bar bottoms out. I also appreciate that all lighting effects are stored in the keyboard, no half-baked software required (here's looking at you, Corsair). What one loses in point-and-click setup is easily made up for in set-and-forget convenience. As others mention, the space bar LED lights are poorly positioned, with light blasting into your eyes. Three short strips of electrical tape later and the space bar lighting is the same as on the other keys. I have never invested in a mechanical keyboard because I was still using a $30 keyboard and mouse combo a long time ago when I built my computer (about 5 years ago). I did a LOT of research and I ultimately was going to get the K70, but reddit brought up the name Ducky when I did one final search. I looked into the Ducky Shine 5 and fell in love with the YOTG edition and I am glad I chose this keyboard. I plan on buying another one soon except with the Cherry MX Browns as I kind of rush bought the blues because I couldn't wait haha. Overall, keyboard: 100/10. I've been using this keyboard for 5 months now. It's my first mechanical keyboard so I really have nothing else to base it on, but I absolutely love it! The blue switches are clicky which is exactly what I wanted; they make it very fun to type (especially at 100 wpm). The build is sturdy (and pretty heavy compared to a normal keyboard, but I don't see this as an issue). I use it for both general purposes and gaming. It makes typing essays for school more enjoyable, and even just making google searches is fun now. I mainly play osu!, MapleStory, and Combat Arms, and this works perfectly for all of those games. Altogether, for my first mechanical keyboard, I'm very satisfied so far (hopefully I will be for a long time to come). There is, however, one small issue I noticed. osu! is a rhythm game where you use two keys only, and you tap those two keys constantly for a very long time. When I had the keyboard in the reactive lighting mode (the one where when you tap a key it lights up, only that key), after about 10 minutes of tapping the same 2 keys over and over again (any 2 keys, I have tried with multiple combinations and received the same results) the lighting goes away color by color. When on RGB reactive lighting, first one of either red, green, or blue will go out, leaving random mixtures of the other two colors, but then as I tap with them more the other colors will eventually stop working too, so when the keys are tapped there is no lighting at all (for just those 2 keys, all of the other keys on the keyboard light as they should). This is very easily fixed by just cycling through the lighting modes until I get back to reactive lighting, but then the same thing happens. To be clear I didn't experience this while typing normally, only when I was pressing those two keys for an extended period of time. This isn't a big deal to me because I hardly use reactive lighting in the first place, but it seemed like something I should share. Great keyboard for a while. This is my 3rd mech. keyboard, and my 2nd Ducky. I love the blue switches and the keyboard is well made. Problem is after a year or less the Cherry switches start to type double letters or none at all. If they were cheaper it wouldn't be such a problem. But at this price I can't afford to replace my keyboard every year. Going back to cheaper switches. Hate to do it because I do really like this keyboard, but just doesn't last long enough. I don't particularly like how the keys feel, and after 6 months of use I have noticed that the space bar has considerably shiny from where my thumb rests. This keyboard is near the upper end in price for non-Topre mechs, but it is worth every penny. Ducky has some of the best backlighting in the business, and it shows in this Shine 5 with pretty rainbow lights dancing across the keys. My favorite modes would have to be the raindrop (the one in the pictures here) and the wave mode (looks like a waterfall of colors rippling down the keyboard). Although a minor complaint is that in raindrop mode, not all of the keys are lit at once, so some are dark as the lights fade out. As for the Cherry MX reds, they actually feel quite a lot like the browns I have on my Deck keyboard, in terms of pressure but without the tiny tactile 'scratch' at actuation. Haven't had any problems typing with them despite reds being colloquially known as a 'gamer' switch; in fact, my typing speed actually went up ~15 WPM compared to my brown and blue keyboards! I was looking for a good RGB keyboard made of good quality. This was it, highly recommended you get it off this Mechanicalkeyboards. My only gripe is the same thing other people have with it. The way the USB connects to the keyboard itself is very awkward and unnecessary. It doesn't affect the functionality of the keyboard, so it's more of a minor hassle, but other than that the keyboard is perfect and probably the top RGB keyboard on the market right now in terms of quality. The nature white switches are fantastic. Best mechanical keyboard I have owned to date. This was the first mechanical keyboard I owned, although I had tried many before this. It was hands down the best keyboard I ever had. Build quality excellent, lighting effects really cool. I got the MX Blue by the way. Only complaint was that the keys were really hard to press I felt I was missing keys when typing because they needed more pressure. Trust me Blue switches should be soft and easy to press. If you get keys that are stiff and need a lot of effort to press or stick in then something is wrong. Sadly I had to replace this keyboard with a Das Keyboard 4 Pro with Blue switches and voila! Day and night difference, super easy to type. Satisfied. Ducky wins hands down on build quality!! I had been using a Ducky Zero with MX Brown switches for the past year. I knew Ducky made a great product and I wanted to switch (get it?) it up to Blues. I also wanted to customize the colors on my keyboard. 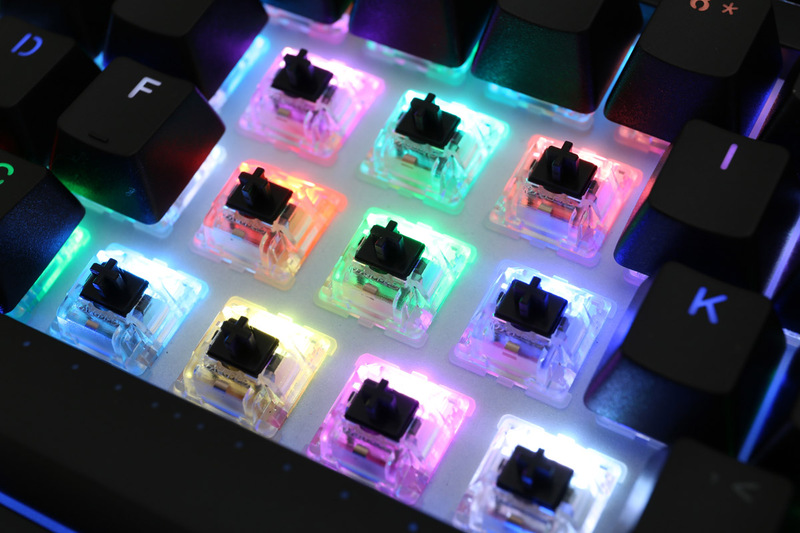 Enter the Ducky Shine 5! This keyboard is absolutely amazing! There are plenty of colors to choose from, the colors are bright, and it is actually fairly easy to customize. I also like that there is no software. I highly recommend this keyboard to anyone looking for a quality product that will last years and provide a wonderful typing experience. Ducky definitely knows how to keyboard and the Shine 5 proves it. As far as I'm concerned, this is the best back-lit mechanical out there, hands-down. With all the programming stored on the hardware you'll soon wonder why you ever messed around with that clunky manufacturer software (I'm looking at you Logitech). The preloaded lighting routines are brilliant and each has 7-8 different animation rates. I find myself changing the routine when I'm bored and varying it's speed on a whim (my favorite is the rain effect). There is a set of uniform-color and a set of color-blending lighting routines. The uniform color can be customized in RGB or chosen from a preset palette shown by pressing fn space. The keyboard has 6 profiles of which 5 allow programmable macros. Along with a customized lighting routine, each profile stores 2 custom zones which are sets of keys that may either be individually colorized, or uniformly breathing. The overall quality of the Shine 5 is what you'd expect at this price range. The cover is a anti-finger-smudge brushed plastic and the keys are mounted on a solid metal backplate, giving the board a satisfying weight. That combined with 5 rubber feet mean this guy won't accidentally be nudged around your desk. Perhaps the weakest part of this board is the usb connection. The mini usb connector goes in a little awkwardly (yet snuggly) and the cable management leaves something to be desired: There is just one wire notch (facing forward) which is too wide to securely hold the provided cable. If this makes you uneasy, I imagine an easy fix would be to buy a thicker cable. 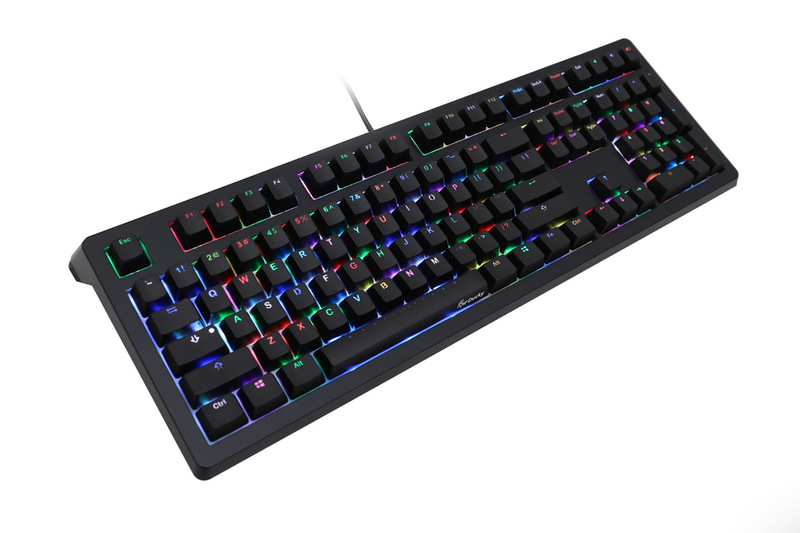 Final verdict-- If you are considering this keyboard because you want a full size RGB backlit mechanical, there is no need to look any further because you've already found the best. Note on switches: The Brown's are an excellent choice for those who do an equal amount of typing to gaming (or, like myself, type but don't want that loud double click from blues). If you want this for gaming I'd recommend a linear switch (black/white/red). *I bought the Shine5 from MechanicalKeyboards.com over a month ago. I have been a mechanical user for 5 years. This was my second mechanical keyboard since the Ducky Shine 5 wasn't due to come out for a few months when I wanted to get one, and ended up with a G710 since I knew it wouldn't last. I like to make sure things I buy for over $100 get well used, so when the Ducky Shine 5 was released I didn't immediately jump on it since the old one was still kicking. A couple months later, and the g710 was struggling to stay alive. I decided then it was time to jump on the Ducky train. I had wanted to get the Nature White version, but they had just sold out, and weren't getting any for the foreseeable future. I was stuck between getting Red, or Black versions. I should have thought it through better because I have heavy hands, but I decided to get the Red version. A week later and I had my new keyboard. Picking it up out of the box I immediately felt just how heavy it is. I unplugged the g710 , tossed it behind me, and then cleaned off the spot where it was sitting before placing down this baby. The first step was locating the cable, and then figuring out how to get it up into its little plug in spot. Once that was done I popped the plug into my pc, and turned on the magic. It started the magic show with the only key lighting up being a white num lock, and so I quickly switched it to multi color mode to see the magic happen. I played around with all the different multi color and single color modes before deciding that I liked the simple rainbow effect where the color rains down the rows changing them to the next color. Its rather pleasing on my eyes, and quite hypnotic. The next thing I did was grab the other space bar with the goat on it out of the box and slapped a piece of half inch scotch tape to create a little transparent barrier for the led glare under the space bar problem. Once that was done it looked so much better with the whole space bar lighting up instead of just some tiny dots from the normal space bar. I switched it to profile 2 to give the macros a spin next. It took me a while to figure them out. Sometimes the book was confusing. I had to go search on google to find some answers. Eventually I got it all figured out though. Unfortunately as much as I loved the Ducky Shine 5 red cherry mx version it did not love me. It yelled out in pain from my heavy handed keystrokes. I didn't want to part with it but I knew it deserved better than me, so I ordered the Ducky Shine 5 Nature white version when it was in stock again. I decided to give this one to my mother for mothers day as she enjoys colorful lights even more than me! Oh my god it's beautiful. Before I bought this, I did my research. I looked around, I looked into Ducky's reputation, I watched all the reviews I could find. Why? because $165 is a lot of money for a keyboard. but oh my god is it beautiful. To start out, it has a decent amount of heft and it feels solid. It is a plastic frame, but don't think for a second that means it's flimsy. Its not. Setup was a breeze, within 10 minutes I had set up macros, set custom lights and made a really nice looking 2 color rotating pattern. (when you change the colors on one of the 1 color modes it actually just adds in the other 2). That brings me to the RGB LEDs. When I was looking at this I watched a bunch of videos, and I assumed that since it's difficult for cameras to pick up different LED's that it would look good, but different when I got it in person. If anything it only looks better. The lights are really bright, the white board under the lights reflects the light really well and it looks awesome. 11/10 best lighting I have ever seen! MechanicalKeyboards.com did a great job of shipping it to me as well! It got here in 3 days and it was in perfect condition upon arrival. This is an awesome website which I would happily shop from again, and I will be directing friends here should they be interested in a keyboard! Great job from both Ducky and MechanicalKeyboards.com! I love this keyboard. 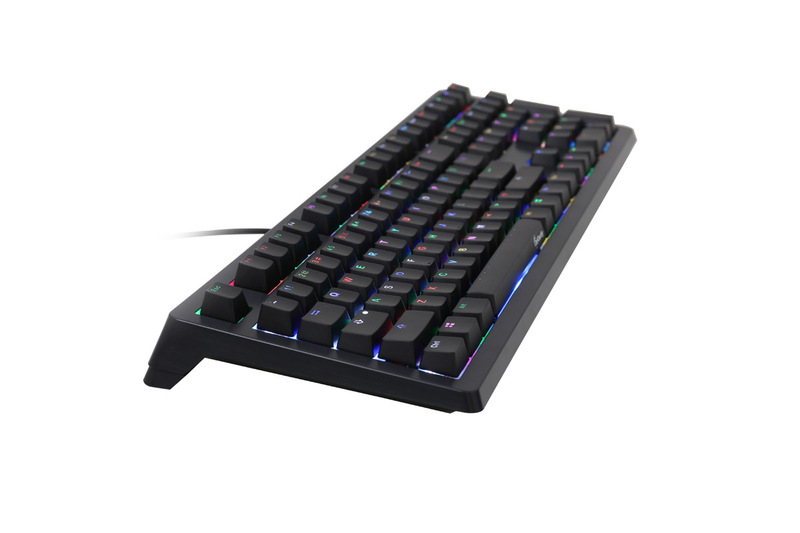 I have tested the Shine 5 alongside several of the big box keyboards such as the Razer Blackwidow Chroma, Corsair Strafe RGB, Corsair K65 LUX RGB, and Logitech G810. I also own a Shine 4 with mx clear switches and blue/red lighting. I won't talk about the software much, but I can go over the physical characteristics of these boards for comparison to the Shine 5. I admit I did not buy any of these boards for gaming as a priority. I can't provide a gaming review on any keyboards. I was on a quest for the perfect keyboard for typing plus lighting. I type a great deal so switches are paramount. However, I was also looking for a keyboard that was very pleasing to use in dim lighting or the dark. Ducky outdid themselves with the lighting on the Shine 5. It is clearly brighter and more vibrant than the Corsair boards despite using similar Cherry RGB switches. Even the improved lighting og the the current Strafe model is dimmer and less vibrant thant the Shine 5. This may be attributed to Ducky's use of larger SMD LED's and the double dual pcb and backplate design. The overall build of the Ducky boards are solid. The much vaunted aluminum faced K65 could not match it. I experienced clearly audible ping on the K65 and the non-removable braided cord shroud separated from the keyboard case within a month. The BW Chroma has bright lighting, which is its claim to fame. However, Razer uses very wobbly keys that I didn't like typing on. This is a moot point for me as I won't buy any more Razer products as long as they require me to log in to their system to use my peripherals. 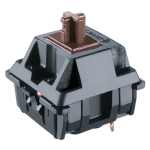 The G810 is a serviceable unit, but the more gamer-centric romer g switches lack the typing feedback of the mx blues. The 810's lighting is strong but has no coverage around the keys. This means that the lighting at the keycaps are bright but the dark space between keycaps makes for a much more understated look. The build was passable, but I wasn't impressed with the thin case and an annoying tendency to ping sporadically. The Ducky Shine 5 has none of these issues. The 5 has everything I love about the Shine 4, but has the improved lighting and a nice brushed patterned case. The outer dimensions of the Shine 4/5 is more compact than the rest of the full sized boards mentioned. It has higher quality key caps, and has the best lighting you can get. The build is excellent with no ping at all and a great footing system. As for typing, I've been enjoying the Cherry mx blue switches. These have provided what is easily the most pleasing typing experience for my long writing sessions. These switches are absolutely sublime. Picture a Cherry MX Red and give it a little more resistance. It feels wonderfully springy and I could honestly type on this forever. Quiet and effective. The colors are fantastic, vivid, and active; the best part of it all is that you don't have to install software or drivers to get these to work out of the box. However, it is a heavy keyboard, so those who frequently love to move their board around, be warned! In my opinion, this is the best linear Cherry MX switch out there. Great keyboard and great switches. This keyboard has all sorts of features that you wouldn't expect. Very happy to have this keyboard. The keyboard itself is nothing short of fantastic and it feels just right. The problem comes when several keys have non-functioning red LEDs. Really hate having to go weeks without a keyboard just to fix a Quality Check issue. The extra space bar came in broken. Awesome keyboard, even at the high price point. The build quality on this thing is much better than the K70, and the LEDs are much brighter. The software-free interface is a real plus too. No clunky slow software to clog up your computer. Pure simplicity. Unfortunately I was extremely unlucky and received a defective board. Upon receiving the device I plugged it in to find that the board will freeze itself in a solid white LED mode when I attempt to change the lighting. Once this occurs there is no way to snap it out of this frozen white LED mode unless you unplug the board for several seconds and switch the power mode when you plug it back in. Thankfully though, the team here at Mechanical Keyboards have been amazing so far, and are helping me get this sorted out. My keyboard is currently sent back to them for repair and I'm hoping for good news! Great keyboard, I just got mine a few days ago, great shout out to Mechanical Keyboards. So far I am loving this keyboard. No software, no issues, fantastic build quality, great keys and amazing backlighting. Very impressed so far. Coming from a Logitech G910, there is quite a bit of a difference between the keys. I love how much more tactile feedback you get with the MX Browns then you do with the Romer G keys used in the G910. * MX Brown Keys - beautiful to type on. * All the bundled accessories. * Works really nicely with the Ducky fullsize arm rest. All in all, i'd give this a hearty recommendation for anyone who wants a great keyboard that will last for a long long time. Received this yesterday, they threw in a free ducky wrist rest. very happy about that. Onto the keyboard, it feels lovely, the coating on the caps is a pleasure to touch. the brown switches are awesome, and I love the keycap puller, though it is difficult to use on the bottom row. the authentic german switches are fantastic compared to the Razer ones I'm used to, the difference is like going from rock soled shoes to foam ones. I do have a couple of gripes, however, the mini USB cable could be longer and nicer (seriously it has like specs written on it and stuff. looks like the cheapest cable they could find) a higher quality rubber or braided one would not go amiss. the gold connectors help to an extent, however. my other con is with the symbols row. it appears to have been printed too small and the light on some of them doesn't shine through properly, but I intend to replace the caps anyway. I have a Ducky Shine 4 with PBT keycaps which has the basic two color LED's, but with the PBT keycaps you can barely see any lighting. When I saw the Shine 5 came with RGB, I was really interested as I never liked Corsair and trusted Ducky for their quality on previous boards (Shine 4, Year of the Horse 60%). Wanted something for work and home, so I chose the Cherry Brown edition, which I had some bad luck in the past. Some times the switches felt dirty or scratchy, but the Shine 5 felt perfect, very snappy. The keycaps while they are ABS, feel much thicker than on the Year of the Horse keyboard. The YotH keycaps are extremely thin but let lots of light through, on the Shine 5, it's still very bright but caps don't make any cheap sounds. All of the keys feel very similar in weight, even the space bar, back space, and tabs. Nothing is loose or tight with the stabilizers. For the RGB coloring, I haven't played with the individual key lighting, just the default settings. I tend to like the rainbow mode that displays a falling rainbow very slowing across the keys. It's relaxing and doesn't make the keyboard look like a EDM concert distracting my eyes. Just enough lighting in a dark room to find the keys and enjoy the back lighting. I also haven't played with the macros, can't speak how they are compared with other software based settings like Razer or Corsair. Overall I really enjoy this keyboard and feels like a very solid design. No flexing noticed (but I'm not slamming down the keys), it's a great choice but a tad pricey. I bought the original Shine when it came out about 4.5 years ago and wanted RGB lighting so I bought a Shine 5. This keyboard so far is well worth the money. The typing feels even better than the original and the lighting is much more vibrant and full looking. I also noticed the build quality seems to be much more solid and I like the new brushed look. The outer casing appears to be metal/aluminum but is actually plastic, but I think this is a good thing because it means less finger prints. The customization options are also pretty extensive. While some of the modes are probably impractical for everyday use, it's still nice to have them. Setting the lighting up for individual keys is surprisingly very easy once you spend a couple of minutes figuring it out. It's nice that everything can be done on the keyboard and you don't need to use software. My only complaint is the manual is kind of confusing for setting up the macros, but this is minor for me. 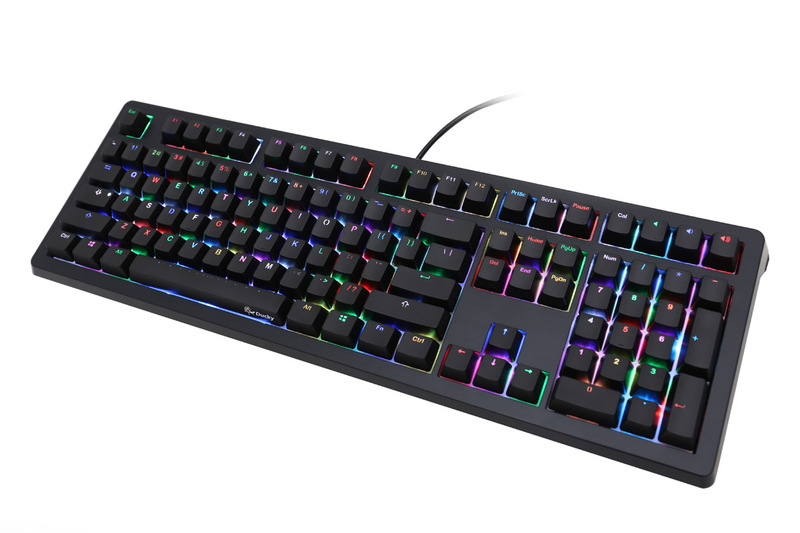 Overall, I would highly recommend buying this if you want a good mechanical keyboard with RGB lighting. Just received my Shine 5 (MX blue) in the mail. Overall, I am very happy with the keyboard. Very high quality, joy to work on and I'm happy I waited for these to be in stock again before I decided on something else. MK shipped the keyboard extremely quickly, and I had it in hand within 2 days. All the LED's work perfectly, and the keyboard was actually built with a higher quality than I had expected. The brown switches feel as if they've been pre-lubed, as they don't even have that "gritty" feeling I've come to associate with new Cherry Brown keyboards. 2. I could wish that the removable "feet" that raise the angle of the keyboard were a bit larger (so angle was raised more.) At the very least, it be nice if Ducky sold taller "feet" as an accessory. Keyboard looks awesome, sounds awesome and just feels incredible. Typing goes extremely accurately with this keyboard! I'm in love. I ordered 2. One is perfect. The other one has a few scratched buttons. some buttons with bad cuts and my backspace is switch is loose. Just received this today after months pining over wanting this. I'm in love. The backlight options are beautiful and fun to try out and the board quality feels very nice. Plug and play and ready to go! If you want a full-sized RGB keyboard then definitely give this a try! Solid keyboard with my preferred blue MX switch. The RGB leds open a lot of lightning possibilities to make a cool mood for the environment. Cons: the LED under the spacebar can be blindingly bright, if you sit at the desk at a certain angle. Excellent build quality. Beautiful color LEDs. Just recieved my Ducky Shine 5 in the mail. I have to say, you guys at Mechanical Keyboards are wonderful. Awesome customer support, awesome prices, and awesome shipping. Not one complaint about the quality of the product when it comes to shipping, it came in mint condition and delivered to her within 3-4 days as advertised. As for the keyboard itself, it's absolutely stunning. From the LED displays on each individual key to the durability of the brush aluminum backplate, it's amazing. I highly recommend this keyboard. Ducky outdid themselves once again.My only complaint about this keyboard is that it doesn't come with a wrist rest. After using my K70 for the better part of a year now I am pretty used to wrist rests and I'm gonna have to go buy one separately now. I will definitely be using Mechanical Keyboards in the future. You guys are awesome. For all you guys out there reading this thinking I'm getting paid to write this I'm not. I'm genuinely impressed with these guys and I guarantee you will be too. I personally enjoy these Whites better than the MX Browns. Linear response for the win! The Nature White Cherry MX version of this keyboard is simply astounding. I love typing on these keys, very durable and responsive. It's now been over a month since it came in on November 12th. It's faring well and I love this keyboard. The colors look amazing, especially since the color doesn't just shine through the letters but around the keys as well. The font is unique and it does come with the YOTG keyboard. There's a nice grainy texture on the keys. They chose to go with screw on rubber ends for the stand which I think was a great idea because it has better grip and makes it even more solid of a keyboard. The ONLY con about this keyboard so far has been the LED's underneath the spacebar. Sometimes, depending on the angle I sit at, they shine right at me because of how low the led's are. It's an amazing keyboard and shipping time was amazing, thank you Mechanical Keyboards. Shipped next day, package came to CA quick from Nashville. Got here in 3 days with free shipping which is very impressive. Came in perfect condition. Keyboard is amazing. Giggled when playing with it. Cant stop finding reasons to type or watch the lights. Worth every penny. I think it's trying to make love to my fingers. My fingers aren't saying no. The DAS that's now leaning against the side of my desk is calling them slutty. They don't seem to care. I was worried about the overall slant angle being too steep (I don't get why makers tend to slant kbs toward you, it adds wrist strain), but it is only slight with the feet removed (10-15 degrees max). Keys are as solid as expected along with the switches and mounts and PCB overlay, keyboard material feels great, and the setup lets the Cherrys give perfect tactile feedback. They put the new processor to great use, the features come across as extensive and flexible. I have only slight beefs: the cord mount on the underside really needs to be able to grab ahold of the cord so it doesn't pull and cause lateral pressure on the port (the Shine 4 had the same issue). The cord could stand to be a little longer too, although it reaches in my decently-spaced setup. There's a reeeally slight vibration on the larger keys feels like, maybe stabilizer-related.nothing slight adjustment should easily fix. The LEDs under the spacebar shine through the gap under the key when I lean back, but I dunno maybe I like it, kinda disco. I'd also like to see the next iteration have no overall slant angle at all, instead providing it completely through the use of the feet (which would be great to be able to attach to either front or back corners). Thanks Mechanical Keyboards, you rock. I received the Keyboard a couple days after Mechanical Keyboards first got them in stock. Overall it has been a great upgrade from my K70 and I am loving the build quality.